* This is my article for ASEAN Voices, a new Jakarta-based magazine, February 2015 issue. 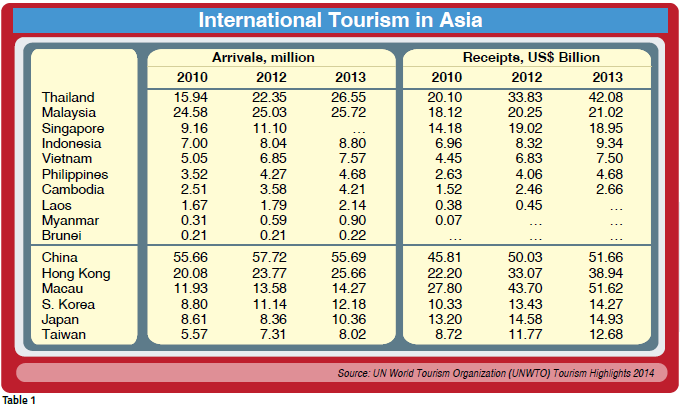 Tourism is a major economic player and job creator in many developing countries including in Southeast Asia. The region places next to China as being the most dynamic and fastest-growing area in the world, as it offers thousands of beach resorts, mountain resorts, and city centers that cater to visitors from other countries. The main destinations for foreigners visiting East Asia are China, Thailand, Malaysia, Hong Kong, and Macau, which is especially interesting because while its visitor-arrivals in 2013 was only one-quarter of that seen on mainland China, its tourism receipts were similar to those from the entire country. What explains for such enormous tourism receipts from Macau? It is, of course gaming and casino tourism. Macau is No 1 on the planet in gaming revenues. In 2013 it reaped US$45.1 billion, followed by Las Vegas with US$6.5 billion; Singapore with US$6.1 billion; Atlantic City at US$2.9 billion; and the Philippines, which took in US$2.2 billion. · Singapore’s integrated resorts in Marina Bay and Sentosa Island, with a combined value of approximately US$9 billion. · Philippines’integrated resort project, Entertainment City at Manila Bay, with a projected value of US$15 billion. · Vietnam’s integrated resort projects in Ho Tram, Danang and Phu Quoc, each involving investments of more than US$4.5 billion. · Cambodia’s projects in Koh Rong island, costing some US$2 billion, along with an integrated resort at Angkor Wat. · South Korea’s integrated resort development in Jejuisland, valued at some US$3.6 billion. These casino developments are evidence of the dynamic and growing competition among countries in the Asean region, as well as in the gaming tourism sector. However, one only has to look at the Las Vegas model, being a once-derelict patch of dry land that has become a multi-faceted entertainment venue centered upon frivolity. It is crucial to note that Las Vegas has never depended entirely upon casinos to bring the cash in. According to the World Trade and Tourism Council, the city’s Disney-style hotels, boasting some 133.000 rooms, along with attractions, shows and recreational activities, account for half of the casinos’ revenue streams, meaning that wider tourism development and casino construction merely go hand-in-hand with one another. 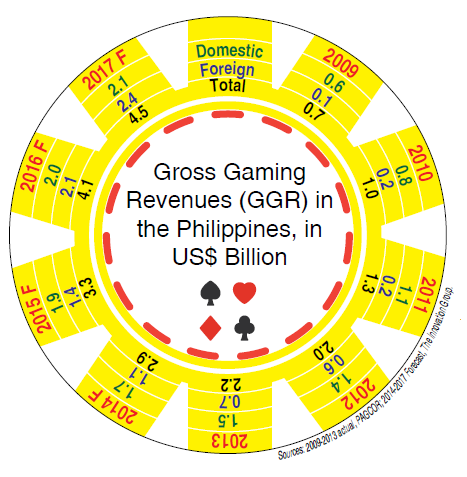 Meanwhile, in the Philippines, the biggest player is the government-owned Philippine Amusement and Gaming Corporation with its dozen-plus casinos in Metro Manila and other major cities throughout the country. But the country’s much-recognized and largest project is “Entertainment City” in Manila Bay, a huge 120 hectare development built on reclaimed land and hosting four huge licensees. Resorts World Manila is the sister company of Resorts World Genting, Malaysia, and Resorts World Sentosa, Singapore. From 2009 to 2013, it was the only casino resort in Metro Manila, until the opening of Solaire Resort and Casino. Solaire is a new and large project by billionaire Enrique Razon, owner of International Container Terminal Services, Inc, which moves ships and cargo to 19 countries throughout the world. The resort includes a five-star hotel with 500 rooms and 1,000-seat ballroom. 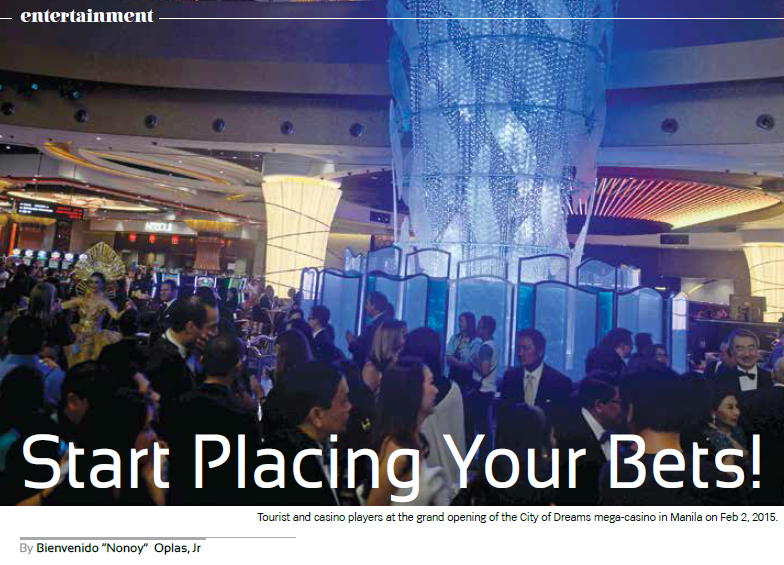 City of Dreams casino held a soft opening last December, then a grand opening on Feb 2. The casino is a joint venture between Henry Sy, the Philippines’ richest family, Australian billionaire James Packer, and Lawrence Ho, Co-Chairman and Chief Executive Officer of Melco Crown Entertainment, and son of Macau casino mogul Stanley Ho. Melco Crown Philippines Resorts Corporation President Clarence Chung said the new casino will provide additional choices for their customer base in Macau. COD has three hotels: Crown Towers, Nobu and Hyatt. It is said to have attracted some 60,000 visitors during its soft opening last December, and since then has averaged 15,000 daily visitors. The Manila Bay Resorts is owned by Japanese billionaire Kazuo Okada. to earn big, increasing from US$2 billion in 2012 to US$4 billion by 2016. Sources: 2009-2013 actual, PAGCOR; 2014-2017 Forecast, The Innovation Group. Regarding area infrastructure, there is ongoing large-scale skyway construction that connects Manila’s four airport terminals to Entertainment City. When this project is completed in 2016, it will drastically cut the travel time for visitors, local and foreign, from the airport to the resort-casinos. But how do most Filipinos view these foreign gamblers and visitors? Generally, their opinions range from neutral to positive. Foreign gamblers do nothing to harm local residents, instead they just spend and spend, winning money if they are lucky, and in the process they provide lots of jobs and lots of tips to Filipino resort employees, officers and entertainers. Direct hires are about 5,000 jobs per casino; hotel rooms supply are expanded. Other sectors, of course, will complain that the gambling and casino culture could permeate many Filipinos’ lives, as people seek to get rich-quick. Yet, this is not a strong argument because there are many types of gambling that Filipinos are now engaged in, from ordinary card games to bingo for charity, as well as the lotto and sweepstakes, and even cockfighting. On the other hand, the government should see the enormous opportunities in the resorts-hotels-casino sector. There is no doubt that casinos need to always be considered in the wider tourism context—as better infrastructure leading into a casino will inevitably allow the casino to have a more positive impact on a region. It is also a large job creator, from airlines to hotels, restaurants and entertainment, and can even evolve into medical tourism. The government, in the meantime, collects taxes from 5%-17% based on GGR. Staring last year, casinos also pay corporate income tax. It is therefore commended that the high taxes that actually also hound many other local businesses is slashed. At the end of the day, when people have high-paying and stable jobs, they become less dependent upon various government welfare and subsidy programs.